How to go from a mere cylinder and make its shape interesting, all the while safeguarding its simplicity. 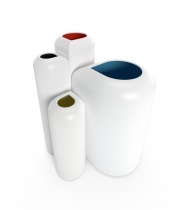 This is the challenge that designer Antoine Phelouzat decided to meet when he created these ceramic vases. Drawing an edge on a cylindrical surface enables surprising outcomes: It becomes possible to both slide and interlock the pieces together; an organic and symbiotic ensemble is born before our very eyes. The concept of an added flat surface creates an unusual geometry and allows for some subtle shadows. The new angle creates a vibration, which then contrasts with the roundness of the cylinder. Once assembled, these four vases with different heights are united in goodwill, like members of a family with their offsprings. Seen from above, their openings are shaped like a drop of water, and together they form a pattern: is there anything better than a four-leaf clover to bring good luck to the home? You never put these vases away, you display them, with or without flowers !